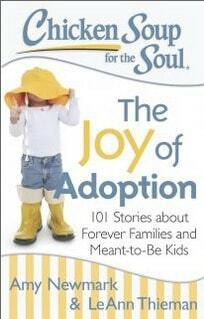 One of the newer books from Chicken Soup for the Soul is The Joy of Adoption. The Joy of Adoption is a reissue of Chicken Soup for the Adopted Soul this issues has even more heartwarming and encouraging stories. Once again the creators of the Chicken Soup for the Soul series brings us inspirational, emotional, and heart warming true stories of adoption. This is updated collection of stories on adoption includes some if the favorites from the last book, The Adopted Soul, as well as 17 new stories. My favorite story is My Really Son…….. The story of a brother and sister adopted from an orphanage in Russia. Their wonder at discovering what true family really is. It looks at the very common fear of some adopted children when suddenly mom has a biological child on the way. The fear of not being wanted or enough anymore and as Edward wonders if he will truly be “a really-son”. I actually read this book in one night because of how engaging it was. I highly recommend Chicken Soup for the Soul: The Joy of Adoption for anyone, especially for those around parents or children in adoptive relationships. The books presents stories that are eye opening and outline the feelings of many adopted children and parents. Chicken Soup for the Soul: The Joy of Adoption celebrates the bond between parents and kids. It is 101 beautiful stories that are touching to read.